In this article, we go through the best car wheel clamps to improve the security of your car, trailer, caravan or other vehicle that you wish to secure. We have been using them on our caravan through summer, we have seen wheel clamps on many motorhomes when they are parked up and the owners are out and they are a great security improvement for many other vehicle types like trailers. The great thing about wheel clamps and wheel claw locks, other than giving that extra security and fixing the vehicle in place until they are unlocked, is that they are a visual deterrent as well. We are very fond of these because it shows that if you lock your wheel down, people may not try to move what it is you're securing or even break in because you're thinking about the security of your possessions. We have ranked the Busyall as the best security wheel clamp you can get for your car for a number of reasons. It is the best because of it's price, how easy it is to use compared to the other alternatives and it's mix of visibility and strength when on the wheel. Remember, not just cars can be secured with a security wheel lock like this. You can secure your trailer which might have a jet ski or boat on it as well as caravans and anything else you might tow. If you have a work van that is stationary for a few days whilst on a job, this can help as a deterrent. Back to the Busyall, although it's more expensive than a couple of the other options, we think it is worth this extra cost. This is because it is one of the most easiest security clamps to use. No matter your wheel size as long as the left arm hooks in to the inside of the wheel the right disc can be moved and then tightened on with the wind up ratchet and then locked in place. This means that both allow wheel car wheels and regular car wheels can both work with this security clamp type. There are others, like the GoodYear, which work similarly, but only hook in to the gaps of a wheel. This extra material on the Busyall gives it more visibility, albeit with a bit of extra weight. If you are after something similar, look out for the Milenco. Another similarly built wheel security lock, it has an inside and outside arm, you spin the ratchet and the arms close in, with one arm sitting where a wheel nut would be and the inside arm curves in the the inside of the wheel and clamping itself around the entirety of the wheel. You can find the Milenco for less money but it also looks less visible from a distance because it is only two thin arms that reach out either side of the wheel you lock it to. We have ranked the Bargains Galore as third because it does feel cheaper than the other two. It has multiple pieces that you fit together, this may be safer overall, but it means it takes longer to lock on to your wheel and you have to work that out first of all. The final two KCT and GoodYear wheel clamps are of a similar design, and that is the case for a lot of the wheel clamps available online and on Amazon. Many different brands share technologies and rebrand, they mostly come from the same factories so that isn't a problem. The reason for these two to be at the bottom of the best wheel clamps and car wheel locks list is that of size. They don't look as formidable, they are hard to notice and the last thing you want to do is forget they are there and drive your car, the damage that could be caused by that would not be worth thinking about. There is a positive with these two, if you are after something that you want to use just as an extra and will be continually putting on your car and removing, this could be perfect for you or even a trailer that needs a little bit of extra protection. No matter your boot size, you can fit this in with no extra thought about it and use it when you need to, it wont take up any extra space like the others would above and they are cheaper and still help in securing a vehicle when you need it. 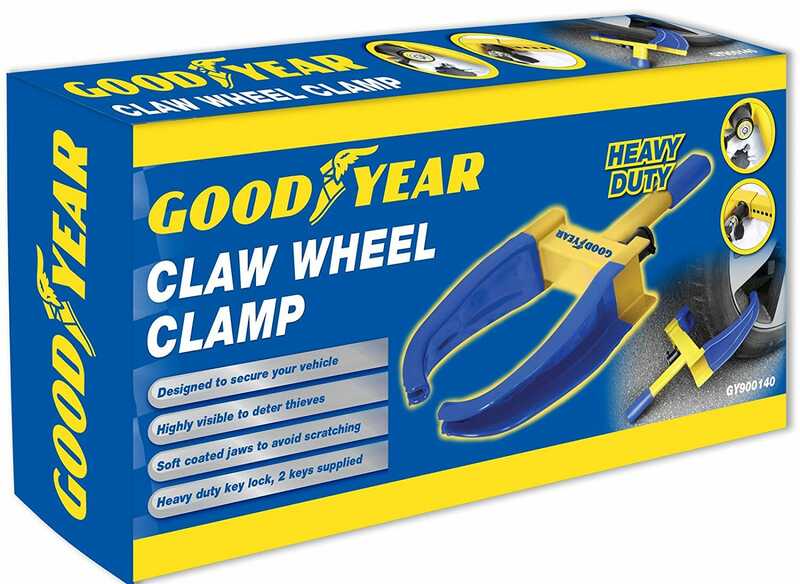 We could see these claw locks being great wheel clamps for motorhomes because you are continually moving them about, setting your vehicle up for the night and then moving on again. Even if you are staying somewhere just for a few hours, putting a claw lock on your motorhome shows positive security and means you can relax when adventuring on foot and away from your campervan. A solid, highly visible solution to securing a vehicle or your trailer, caravan with a regular sized wheels. This is a review of the BARGAINS-GALORE Security Wheel Clamp. The security wheel clamp from Bargain Galore is strong and robust, made of a solid steel construction and coated with a highly visible yellow lacquer, which helps to deter thieves. The clamp is not particularly heavy weighing just over 5 and a half kilos. This is perfect for moving it from vehicle to vehicle or taking it on and off a single car or caravan or trailer, whatever you want to secure. A handy feature to this wheel locking clamp is that it i adjustable with a locking bar with holes that allow the clamp to fit to wheels from 13 to 15 inch in size. It is a little fiddly at first working out how to attach to a wheel but once you learn how to get it set up, you'll never have a problem again. For the price, we can't really fault it, seems to fit most wheel sizes, so great for trailers, through to caravans and your car. Highly visible and once you work out how it works is a good wheel clamp. One of the downsides we noticed is that there are similar tech wheel clamps that come in a different brand.